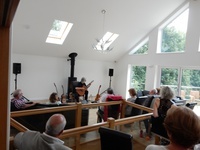 It had long been a wish for Maria and I to get Gordon to play at the housewarming of our new house in Cornwall and the wish finally came true at the end of July. Gordon was booked to play on the Saturday evening, but, given the distance to be travelled, he and Hilary would stay with us from Friday until Sunday. Gordon and Hilary arrived in Cornwall, tired and emotional, on the Friday afternoon, having suffered the worst weekend’s travelling of the year! However, cups of tea some cake and an evening meal of lasagne revived them and it was great to spend time with them and find out so much about Gordon’s career and the vast number of people he has worked with and knows. Setting up of the equipment was done on Saturday morning with Gordon and the four guitars he had with him. The first special part of the weekend was Gordon playing our favourite pieces for us to make sure that everything was in tune and sounding spot on. 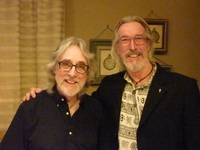 One of the highlights for me was having Gordon play the Dodo’s Dream almost one to one – absolutely perfect. In the afternoon, Gordon decided to warm up/practice pre-concert and played on one of the benches in our garden while we were sat on a balcony listening and enjoying some more, great guitar playing and discussing with him some of his favourite tunings and the pieces that he had written using them. The concert itself was fantastic; two sets totalling one hour and forty five minutes, with a break where Gordon happily chatted with our guests, while enjoying a glass of Pimms, which he discovered he rather liked. The guitar playing was, as one would expect, incredible and the banter with us and our guests added to a wonderful experience. Everyone thought the concert was brilliant, awesome and a rare chance to see one of Britain’s best guitar players up close and to get the opportunity to talk with him and Hilary. We had a wonderful time! Thank you so much for the invite. Isn't Gordon a lovely guy? It really was a privilege to hear him play. We thought the whole thing was brilliant, inspirational and an absolute treat to hear and watch at close hand Gordon performing his magic on his numerous guitars sprinkling the fairy dust that only musicians at the top of their profession can provide. During breakfast on Sunday Gordon once again treated us to some great tunes while waiting for his second helping of toast and jam – quite surreal having him play while we ate and drank! Gordon and Hilary left us late on Sunday morning – they had been the perfect house guests and it was a real privilege to get to know them and spend time with them. It is weekend that the family will always treasure. 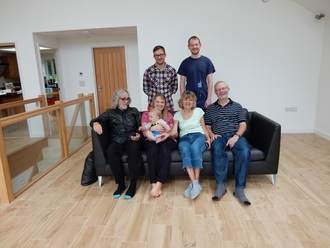 Also in the picture are our sons David and Matthew with his wife Jen with their son Arthur.